Fantastic venue discovery. . .
Last night I did a gig with Navaro at an amazing venue, deep in the Essex countryside. 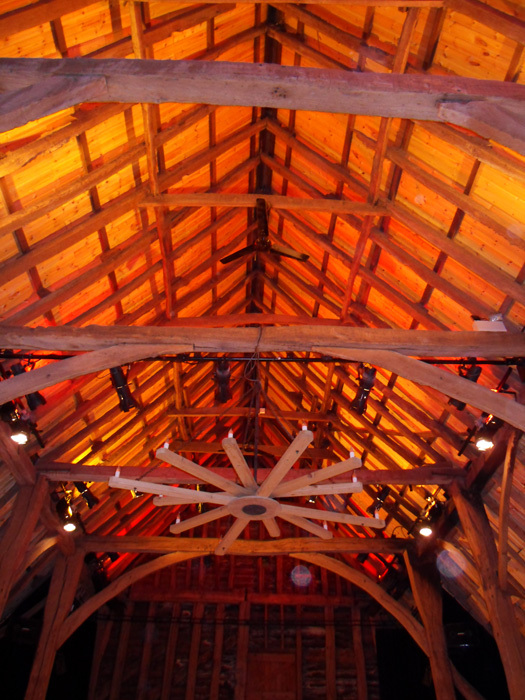 Called The High Barn, it’s an 800 year old grain barn that has been lovingly restored into a high class venue, whilst also incorporating a recording/graphic design/IT consultancy studio complex – and all in the tiny Essex village of Great Bardfield. 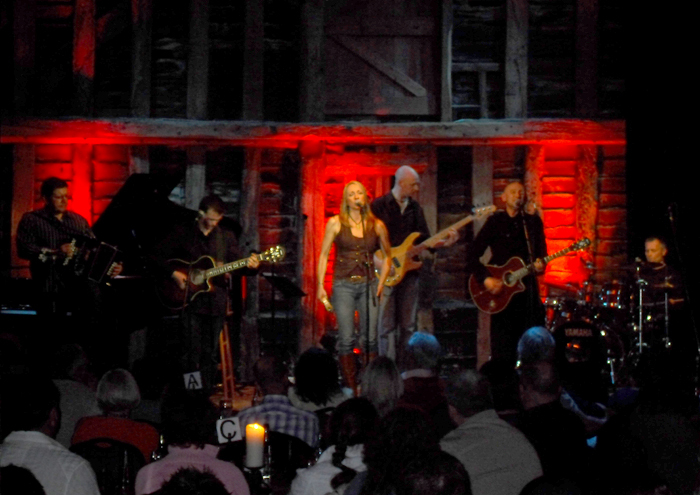 Here’s a shot of what the inside of the main barn looks like, and below that a rather dark/grainy shot of us on the stage. The acoustics and atmosphere there are really amazing, the staff were great, and the facilities for the artists were extremely comfortable – I’d recommend it to anyone, both as a place to play and listen/watch. 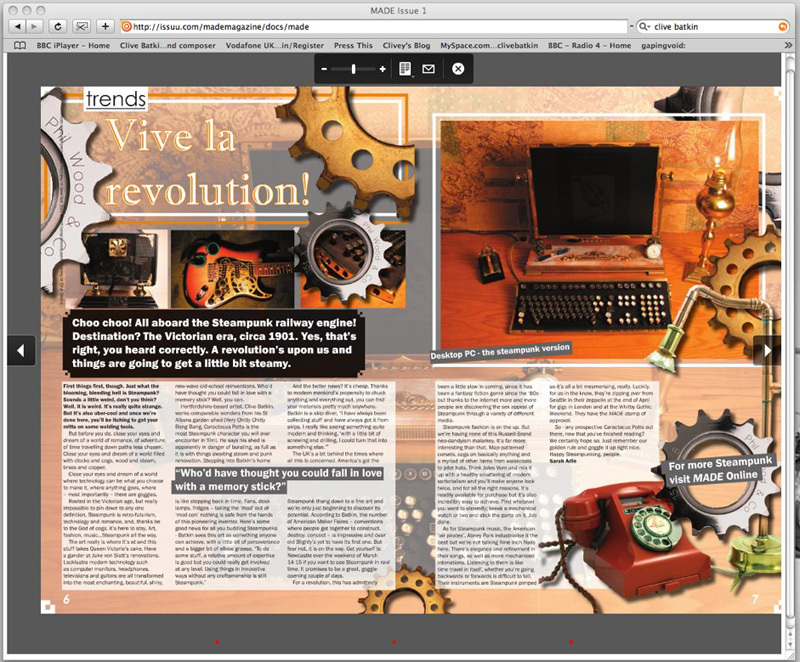 MADE Magazine Issue 1 (steampunk-tastic!) is out. . . So, (as you may remember from an earlier post) I got interviewed a little while ago about my steampunk stuff, for inclusion in a new online magazine called MADE. Issue 1 is now out, and can be seen online here. The full steampunk article is on page 6 where there is an interesting montage of shots, including one of The Optimus! It’s a really nicely put together magazine, and there is a website/blog site to support it here. Friend’s CD gets great review. 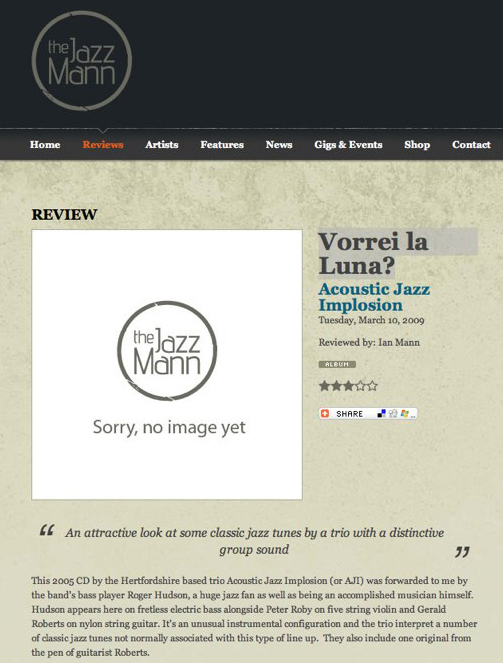 . .
a really nice review of some of his music on the Jazz Mann blog. and you can check out more of their details and some sound clips here. He’s posted these up, along with a few new things, on his blog – tune in and check them out! For ages now I’ve been looking for something I could use to add ‘feet’ to the bottom of my living room speakers. Such ‘feet’ needed to be quite sturdy, not too tall / not too short and fit with the new aesthetic of my freshy-decorated / themed room. Just the right size/shape and, when upturned into an upside down ‘U’ arrangement, they proved to be just the ticket! I was going to paint them black, but actually I quite like the natural red colour – seems to work for the moment at least. And here’s a view of the supports in place – splendid! My colleague/friend AK is in his final year of a MA in Design Studies at Central St Martin’s, and is working on his dissertation entitled ‘The Campfire Project’ (details as per his blurb below). This is basically a ‘viral’ music project, to see how a piece of music can be developed/evolved/changed by a succession of musicians doing one thing to it, taking in their own direction, and then passing it on – he’s now looking for people to get involved/comment on the idea…!! If so, an mp3 of the track so far can be found on his blog – feel free to do anything to it as he suggests below… if anyone participating can write to him to keep him informed of progress/where the track stands, that would be great! (campfire@andreknott.com) or comment on the blog. If anyone wants the original drum track to do start their own separate version, that works too – again it’s on his blog. My idea – The Campfire Project – is about finding ways to create interesting new music. I want to see how a sound can developed in different new ways. The idea is to take a humble beginning and see what happens by letting things develop with a variety of input. …when you are done can you pass it on, (you only need to pass on the final mp3). 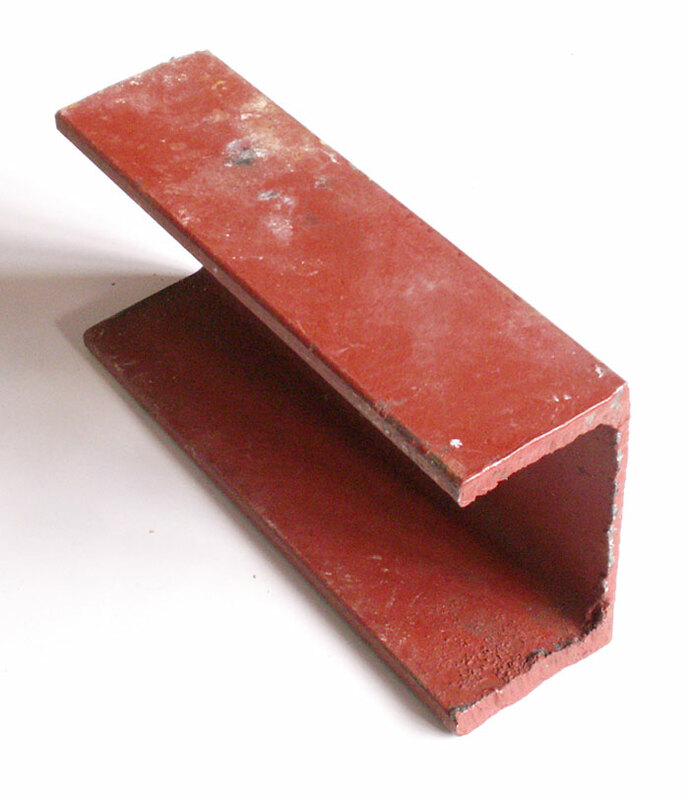 I would also appreciate any thoughts you have had about doing this project, could it be done in a better way, did you enjoy participating, do you think that this process has resulted in something good or do you think that it was not that successful… or anything else you want to say. Just a quick footnote, this is college project and a collaborative effort. I do not intend to release it or profit from it, however I may get radio play and present it in exhibitions and as part of a website about my work, so please only take part if you are happy to let your ideas be used and shared randomly. I will probably post the results online in the future, so return the files with your email so I can let you know when it happens. Thanks for your help in advance, and happy music making. 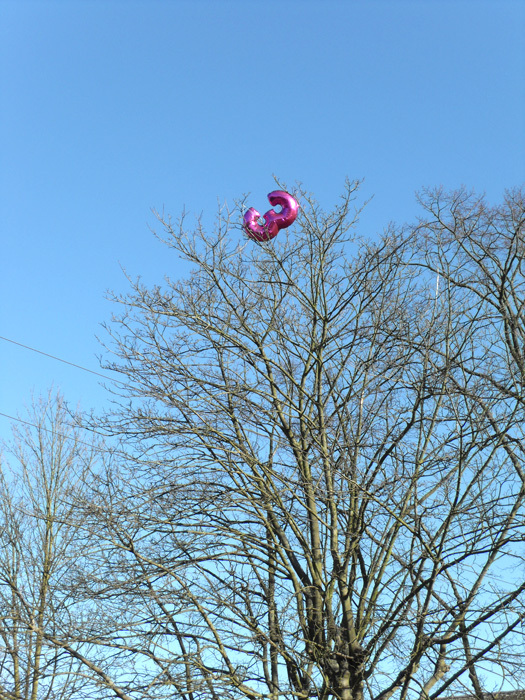 Not only did I really like the colours, but I thought it just about summed up how I feel about things most days – namely that the bright, shiny dreams of our youth invariably end up stranded in a tree somewhere, tantalisingly out of reach and just about to deflate any minute…! Think I need to cheer up a bit!